Dipa Ma embarked on her second retreat in a very different frame of mind—less urgent and impulsive, more planned and thoughtful. Although she had been an insomniac since the death of Rajani, now she found that she could not stay awake. By the third day, however, she was able to attain a deep state of concentration and the need for sleep vanished, along with the desire to eat. Munindra, concerned that her concentration was out of balance, requested that she attend Mahasi Sayadaw’s weekly talk, even though she couldn’t understand Burmese. She didn’t want to go, but Munindra insisted, and to please him, she went. On the way to the talk, Dipa Ma began to experience heart palpitations. Feeling very weak, she ended up on her hands and knees, crawling up the stairs to the hall. She didn’t understand the talk but continued her meditation practice. After the talk Dipa Ma found that she couldn’t stand up. She felt stuck in her seated posture, her body stiff, immobilized by the depth of her concentration. 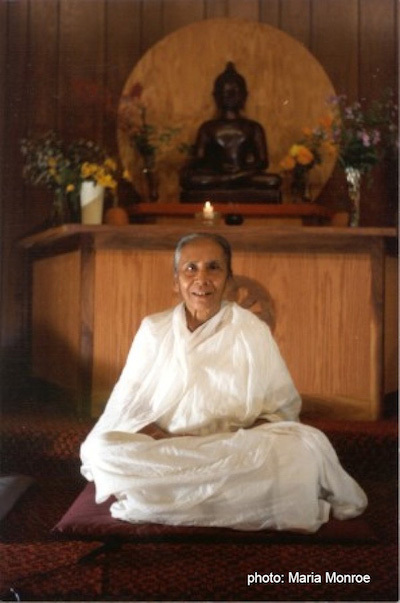 In the following days, Dipa Ma’s practice deepened dramatically as she moved rapidly through the classical stages of the “progress of insight” that are said to precede enlightenment, according to the teachings of the Theravada Buddhist (South Asian) tradition. She experienced a brilliant light, followed by the feeling that everything around her was dissolving. Her body, the floor, everything was in pieces, broken and empty. That gave way to intense mental and physical pain, with an excruciating burning and constricting in her body. She felt that she would burst with pressure. Then something extraordinary happened. A simple moment—it was daytime, she was sitting on the floor, practicing among a group of meditators—an instantaneous transition took place, so quiet and delicate, that it seemed as if nothing at all had happened. 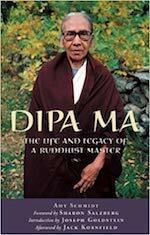 Of this luminous instant Dipa Ma was later to say simply, “I did not know,” and yet in it her life had been profoundly and irrevocably transformed. After over three decades of searching for freedom, at the age of fifty-three, after six days of practice, Dipa Ma reached the first stage of enlightenment. (The Theravada tradition recognizes four phases of enlightenment, each producing distinct, recognizable changes in the mind.) Almost immediately her blood pressure returned to normal and her heart palpitations diminished. Previously unable to climb the meditation center stairs, this ascent was now effortless, and she could walk at any pace. As the Buddha had predicted in her dream, the grief she had borne day and night vanished. Her constant fearfulness was gone, leaving her with an unprecedented equanimity and a clear understanding that she could handle anything.